Whether you are a professional contractor, a DIYer, or a hobbyist, there will come a time when you need professional fabrication services near St. Paul, MN. You might need a new keel manufactured for your sail boat, or you may need custom machine parts created for your manufacturing plant. No matter what your fabrication needs are, you can rely on Garelick Steel Company & North Second Street Steel in Minneapolis to meet them with professionalism. We also provide laser cutting services, so if you need a custom part created for any reason, rest assured that we have the technology to create the item for you. We work with aluminum and various forms of steel, including stainless steel, structural steel, and steel sheets, so we can help you create the specific metal products you need. To learn more about the fabrication services we offer, keep reading. To get in touch with us directly, call our Minneapolis location at 888.521.8857. Our team provides comprehensive steel services, including brake and shear work, laser cutting services, and welding work. Brake press—The brake press bends metal sheets. 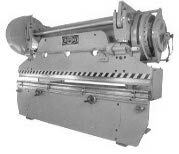 We use Accupress machines, which accommodate steel with dimensions up to ½” x 10’ or ¾” x 4’. Our three-axis press has a 400 ton capacity, while our two-axis press handles up to 60 tons. 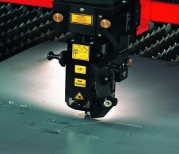 Computer numerical control (CNC) shear—Used to cut large sheets of metal to the desired size, our Accushear accommodates sheets with widths up to 12 feet in either ½” thickness for steel or ⅜” for stainless steel. Laser cutter—For precision cutting, we use a 3,300 watt dual pallet. We can use this cutter on sheets up to the following thicknesses: ¼” for aluminum, ⅝” for stainless steel, and ¾” for standard steel. Metal punch—To create holes in metal components, we use metal punches. Our equipment includes two HMI Iron Worker punches, one with a 90 ton capacity and one with a 68 ton capacity, and a Stripit machine with a 30 ton capacity and wide 18” opening. Saw—For routine cutting, we use our two Marvel saws. Each saw has a 45 degree miter maximum, one of them being a standard saw with an 18” x 18” capacity, with the other being an auto feed saw with a 10” x 14” capacity. Welding crane—We offer joining and repairs in our 12,000 square foot welding space. We have 1 x 3, 2 x 2, and 3 x 5 ton cranes for this purpose. Not sure what services you need to achieve your vision? Consult with our knowledgeable team for personalized recommendations. Garelick Steel Company & North Second Street Steel has over 25 years of service to individuals and business professionals in the St. Paul, MN area. We can handle orders of all sizes at our high-tech 25,000 square foot fabrication shop. At Garelick Steel Company & North Second Street Steel, we pride ourselves on providing quality service to our customers and friends. 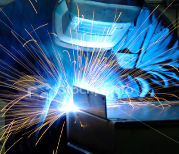 With over 25 years of experience and a fabrication shop covering 25,000 square feet, we can offer our customers a diverse range of metal fabrication services, including repairs, laser cutting services, and welding. When you need metal work near St. Paul, MN, don’t hesitate to give us a call. We are located in Minneapolis but serve St. Paul and other surrounding areas in Minnesota. Click the “Request A Quote” button below to get started!